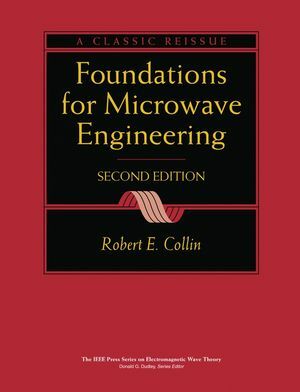 FOUNDATIONS FOR MICROWAVE ENGINEERING, Second Edition, has extensive coverage of transmission lines, waveguides, microwave circuit theory, impedance matching and cavity resonators. It devotes an entire chapter to fundamental microwave tubes, in addition to chapters on periodic structures, microwave filters, small signal solid-state microwave amplifier and oscillator design, and negative resistance devices and circuits. Completely updated in 1992, it is being reissued by the IEEE Press in response to requests from our many members, who found it an invaluable textbook and an enduring reference for practicing microwave engineers. An Instructor's Manual presenting detailed solutions to all the problems in the book is available upon request from the Wiley Makerting Department. Robert E. Collin is the author or coauthor of more than 150 technical papers and five books on electromagnetic theory and applications. His classic text, Field Theory of Guided Waves, is also a volume in the series. Professor Collin has had a long and distinguished academic career at Case Western Reserve University. In addition to his professorial duties, he has served as chairman of the Department of Electrical Engineering and as interim dean of engineering. Professor Collin is a life fellow of the IEEE and a member of the Microwave Theory and Techniques Society and the Antennas and Propagation Society (APS). He is a member of the U.S. Commission B of URSI and a member of the Geophysical Society. Other honors include the Diekman Award from Case Western Reserve University for distinguished graduate teaching, the IEEE APS Distinguished Career Award (1992), the IEEE Schelkunoff Prize Paper Award (1992), the IEEE Electromagnetics Award (1998), and an IEEE Third Millennium Medal in 2000. In 1990 Professor Collin was elected to the National Academy of Engineering.